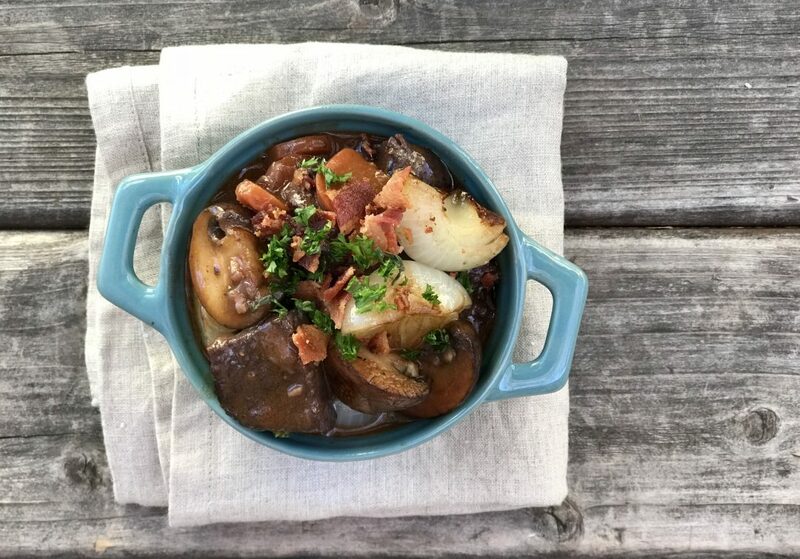 Beef Bourguignon is a classic French dish that will forever remind me of culinary school. French for “Burgundy beef,” this is a rich well-known, French meat stew. A simple food in many ways, the dish is flavored with garlic, onions, carrots and herbs. There is nothing all that fancy about this dish, but it’s wonderful. 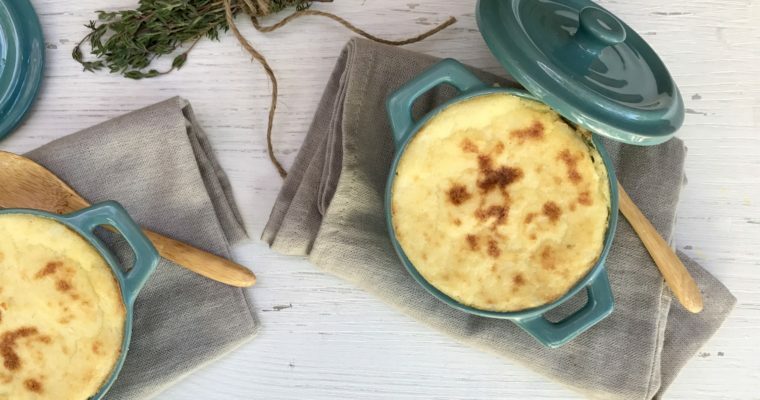 Chances are, you’ve had this popular dish, and if so, you know what I’m talking about: it’s true comfort food, especially on a chilly winter evening. In culinary school this dish is all about technique. It’s about how you cook each ingredient—from the mushrooms and onions to the beef—that makes it such a wonderful dish. 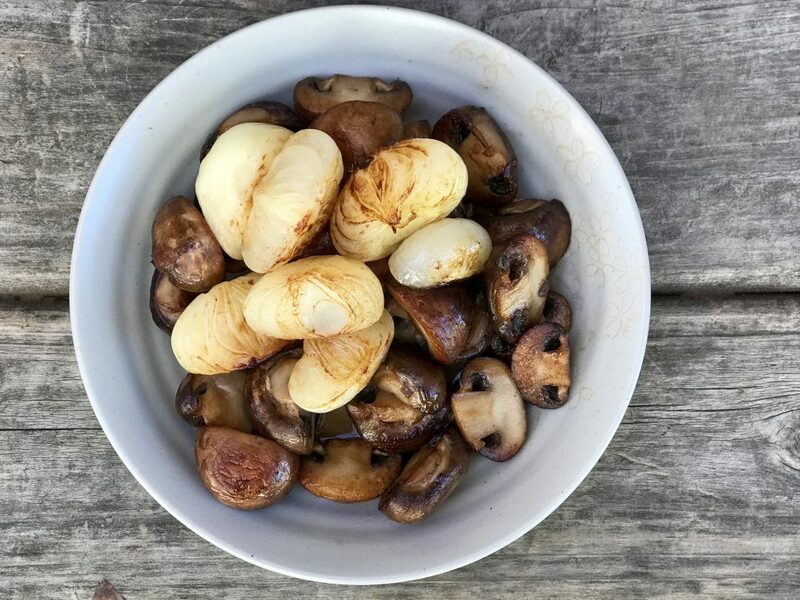 Julia Child included a recipe for Sauté de Boeuf a la Bourguignonnein Mastering the Art of French Cooking. No one does it better than Julia. If you’re interested, check out this video of Julie whipping up this French classic. No surprise, I’m a bit of a Julia fan. I had the honor of meeting her when I was in culinary school; I was humbled just being in her presence. Julia believes this dish should be served in a casserole-type serving piece, and I happen to agree. Large or small, a casserole dish keeps this meal rustic, classic and comforting. 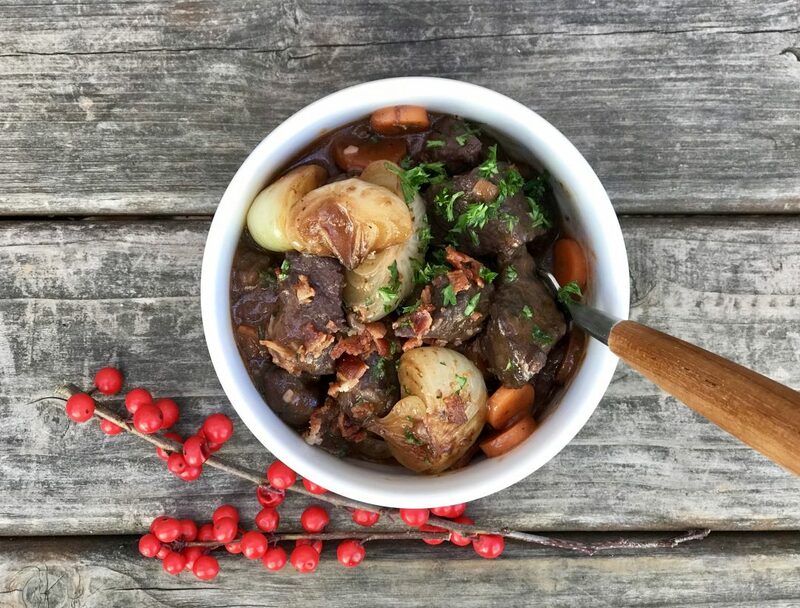 Although Julia often gets credited, Beef Bourguignon is actually famous thanks to the well-known chef Auguste Escoffier who first published the recipe in the early 20th century. 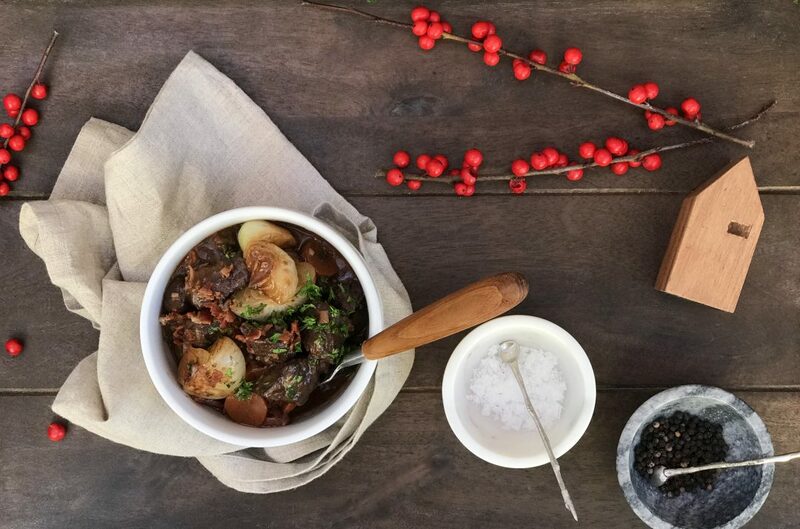 Once considered peasant fare, Beef Bourguignon quickly became haute cuisine. Escoffier’s original recipe actually called for a whole piece of beef in the stew. It was Julia Child who adapted that, calling for beef cubes. That change, although simple, made this recipe more accessible, and appealing, to a whole new generation of cooks. 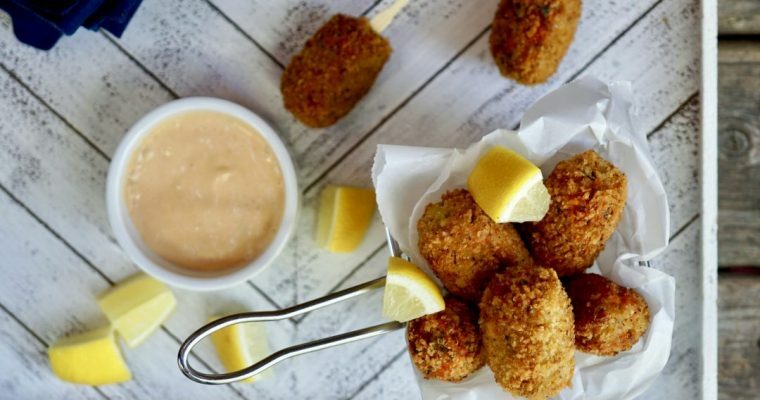 This is not a quick meal, but it is delectable and well worth the effort. Step 1 Place the cubed beef in a medium size mixing bowl. Season generously with kosher salt and pepper. Toss well to coast and allow to marinate for 30 minutes. Step 2 While the beef is marinating, place medium-large Dutch oven or a heavy-bottom pot over medium heat. Add the bacon and cook until crispy, about 10 minutes. Place the bacon on a plate lined with paper towel and set aside. Reserve the fat in the Dutch oven. Step 4 Add 1 tablespoon of olive oil to the reserved bacon fat. Turn the heat to medium-high and when hot, but not smoking, add the beef in a single layer and cook until well browned on all sides, about 10 minutes. Transfer the cooked meat to a plate and reserve. Step 5 Add the 2nd tablespoon of olive oil. When hot, add the yellow onion and carrots and cook till slightly tender about 5 minutes. Add the garlic, tomato paste and four and cook for an additional 1 minute. Step 6 Add the wine, bay leaf and fresh thyme. Add the browned beef. Place a tight-fitting lid on top and place in the oven. Cook for 1 1/2 hours, gently stirring halfway through the cooking process. Step 7 While the beef if in the oven, cook the cipollini onions. Place a large sauce pan over medium heat, add 2 tablespoons of butter. When melted and bubbling, add the cipollini onions, water and pinch of sugar. Cook, stirring occasionally tender and until lightly browned, about 10 minutes. Place the cooked onions on in a small bowl and set aside. Step 8 Place the sauté pan back over medium-high heat. Add the remaining 1 tablespoon of butter. When hot, add the mushrooms and cook until lightly browned, stirring only as necessary, for about 5 minutes. Reserve. Step 9 When the beef has finished baking, remove from the oven and add the sautéed cipollini onions and mushrooms. Step 10 To serve, divide among small individual casserole dishes. Garnish with crumbled crispy bacon and chopped parsley.